MONTREAL -- Statistics Canada says maple syrup production increased three per cent this year to a record 12.5 million gallons as taps were added in most maple-producing provinces. Quebec produced 92 per cent of Canada's maple syrup output, rising 2.8 per cent in the year. The total output follows a bumper crop in 2016, which saw production increase 36.5 per cent nationally. That was on a 38.3 per cent growth in Quebec due to favourable weather conditions that resulted in higher yields. New Brunswick production rose 4.4 per cent to 551,000 gallons, Ontario was up 6.8 per cent to 425,000 gallons and Nova Scotia rose 18.7 per cent to 57,000 gallons. The total value of maple products increased two per cent to $493.7 million due to increased production. However, the price of syrup decreased on the year as more syrup in New Brunswick and Ontario went to the lower-priced processing market. Meanwhile, the value of honey produced in Canada increased 11.1 per cent to $169.3 million on higher prices even though production was down 2.6 per cent due to poor weather conditions in Eastern Canada. Production on the Prairies increased 1.1 per cent to 79.1 million pounds. However, production was down almost 50 per cent in Ontario and 5.1 per cent in the Maritimes. More than 10,000 beekeepers oversaw nearly 790,000 colonies this year. ​Can maple syrup reduce inflammation? In 2012, the International Maple Syrup Institute (IMSI) developed a poster and rack-card designed to distinguish pure maple syrup from other common sweeteners such as corn syrup and processed white sugar. Many IMSI members in both Canada and the United States utilized these resources in their consumer awareness and promotional programs over the last 5 years. However, since their release all sugars, including maple syrup, have come under ever widening and more aggressive attacks from health organizations and government agencies. Accordingly, the need has increased for the maple industry to distinguish natural sweeteners, such as pure maple syrup, from other common sweeteners, which have no merits beyond their carbohydrate content. As you probably know, the IMSI is currently working on the development of a generic slogan and associated messaging for pure maple products, as a high priority component of our marketing implementation plan. 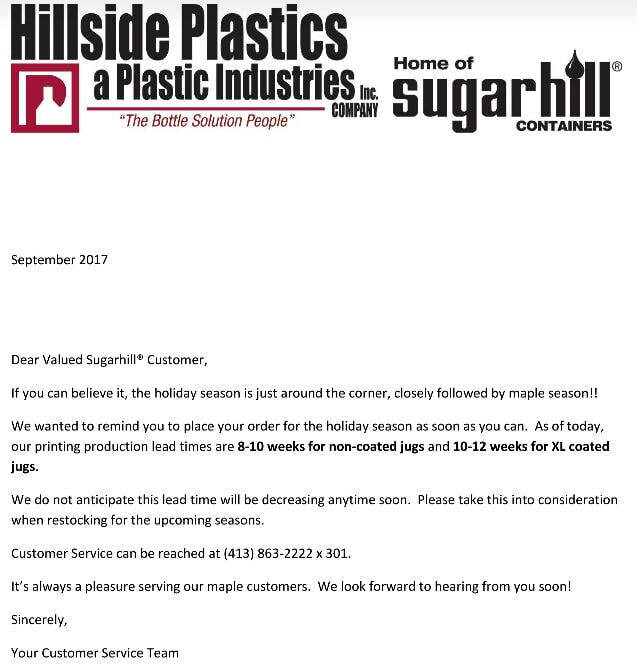 Since updated IMSI materials pointing out the uniqueness of pure maple products to be generated from this effort will not be available for the 2017 maple production season, I have attached a copy of the materials we developed earlier which are still very relevant and can be used in the interim. I encourage you to utilize them to complement other supporting materials which you are currently utilizing in this regard as part of your ongoing consumer awareness,education and marketing efforts. MSPAC, in partnership with the CT Park and Forest Association and the CT Department of Environmental Protection, received a grant from USDA and CT Dept. of Agriculture to assess the potential to substantially increase the production/dollar value of CT maple products with a three pronged approach. (1) Increase the maple trees tapped. Connecticut currently taps less than 1% of the maple trees in the state that are old enough to be tapped. Not only is the goal to increase trees tapped but also to promote environmentally sustainable forest management by CT land owners through increased use of the lands for maple syrup production. (2) Enhance current equipment to achieve significantly increased productivity in current operations. New environmentally friendly technologies (vs. 10 years ago) have quadrupled syrup yield per tap and output per energy unit while significantly lowering operating costs with virtually no increase in carbon emissions. (3) Develop a marketing model that includes CT maple sales in high traffic retail outlets in addition to current specialty stores, farmers’ markets and farm stands. The grant was awarded in 2010 and runs through 2013. Two pilot programs are underway. At the end of the grant results will be published. Maple syrup and maple sugar (dehydrated maple syrup) were the New World's first natural sweeteners. Long before European settlers arrived with the European honeybee to make honey, American Indians dwelling in the Northeast were setting up sugaring camps among the plentiful sugar maple trees each spring. These camps produced an indigenous nutrient-rich sweetener high in minerals. Indian folk tales present several different versions of how it all began. One legend tells the story of an Iroquois chief who threw his tomahawk into a maple tree one early March eve. When he retrieved it the following morning to go hunting, he noticed sap oozing from the cut in the tree. He collected some in a container and his wife added some of the syrup to the meat she was cooking for dinner. As the sap boiled down, a wonderful sweet maple flavor remained. The Indian process of sugar making, crude by modern-day standards, employed hollowed out logs, heated rocks for evaporating the sap, and handmade birch bark containers for collecting the sap and storing the maple sugar. Most of the tribes boiled and crystallized the sap they collected into a granulated maple sugar—bypassing the syrup stage as syrup was harder to store—ending up with a more transportable sweetener. Oliver L. Scranton, Maple Grove Farm, North Guilford (c. 1960). By age seven, I was an integral part of the sugaring operations at Maple Grove Farm in North Guilford, Connecticut. Maple sugaring was a family affair, and each one of us had a role to play. I was the tour guide, and I took my job very seriously. I would show visitors the sap buckets and collection tanks, let them taste the clear, sugar-water-flavored sap and explain the entire sugaring off process. Everything I knew I had learned from my grandfather, whom I adored. He taught me that it was the Native Americans who shared the secrets of maple syrup production with our ancestors, even though there were plenty of sugar maples in Europe. He taught me that the sap runs when cold nights alternate with warm days – and that the sap stops running when the leaves start developing. Finally, he taught me the show stopping statistic that was guaranteed to get a low whistle: it takes 40 gallons of sap to make just one gallon of syrup. By age seven, Erica Holthausen was the official tour guide for maple syruping operations at Maple Grove Farm in North Guilford, Connecticut. A marketing mentor and freelance writer, this article first appeared as a part of a Food Memories book published as part of A Life in Context Project. Maple syrup may not yet be classified as a health food, but it’s getting close! Research results, mostly coming out of Canada and based in large part on work done at the University of Rhode Island, are showing that maple syrup delivers nutritional benefits superior to other common sweeteners and that it compares very favorably to some common “healthy” foods on a nutritional value basis. Here are two comparisons that support these points. Source: Canadian Nutrient File, 2007 (Health Canada) and US Food and Drug Administration. Source: US Department of Agriculture Nutrient Data Laboratory. The Canadian Nutrient File (Health Canada) and US Food and Drug Administration. There is more. Antioxidants are best known for their health effects in disease prevention, including neurological diseases, heart diseases and some forms of cancer. Maple syrup compares favorably in this context versus some of the healthiest foods. Source: USDA Database for the Oxygen Radical Absorbance Capacity (ORAC) of Selected Foods. Results showing the antioxidant power of maple syrup were obtained from Brunswick Laboratories, a USDA-certified facility. To me, the most significant fact in the above comparisons lies with corn syrup. In various forms it is in many of the foods we consume from potato chips to ketchup to beef (beef cattle are fattened in feedlots on a diet of corn). And, of course, it is the only sweetener in table syrups like Aunt Jemima. Evidence is growing that corn syrup is not only basically empty calories, but it may be the primary cause of the current obesity epidemic. I am not in favor of banning corn syrup from the American diet or maple syrup replacing it in potato chips or, for that matter, gasoline where a corn derivative takes the name of ethanol, but I do want a bigger share of the sweeteners that are poured on pan cakes and waffles!!!! Maple syrup has fewer calories per serving and provides a lot more nutritional value than corn syrup.